Magen David Adom paramedics reported finding four people; A man in his 40s, who was pronounced dead at the scene, a woman in her 40s has been evacuated while sedated and intubated, and rushed to hospital with a severe head injury, an additional 14-year-old girl with a gunshot wound to her stomach is in serious condition and a 15-year-old male was lightly injured. The injured were taken to Hadassah Ein Kerem Medical center and are being treated by doctors in the hospital’s trauma unit. The four were members of a family, driving in the area. The Palestinian gunman was still at large. MDA paramedic Zaki Yahav, who treated the injured, described encountering a difficult scene. “We saw a car turned upside down on its roof with four family members inside,” he said. “A man in his 40s was trapped inside, unconscious, without a pulse and he was not breathing. He suffered from gunshot wounds and accident injuries. With the help of an IDF unit we tried to provide him with medical assistance, but had to pronounce him dead soon after,” Yahav said. Outside of the car, paramedics found a woman in her 40s who was semi- conscious, suffering from gunshot wounds. She was given life saving care and rushed to hospital, the paramedic added. “We also saw a 13-year-girl, fully conscious, with gunshot wounds to her upper body. We treated her and evacuated the girl to hospital in moderate condition. A 15-year-old boy with light wounds was also treated, and evacuated,” Yahav added. 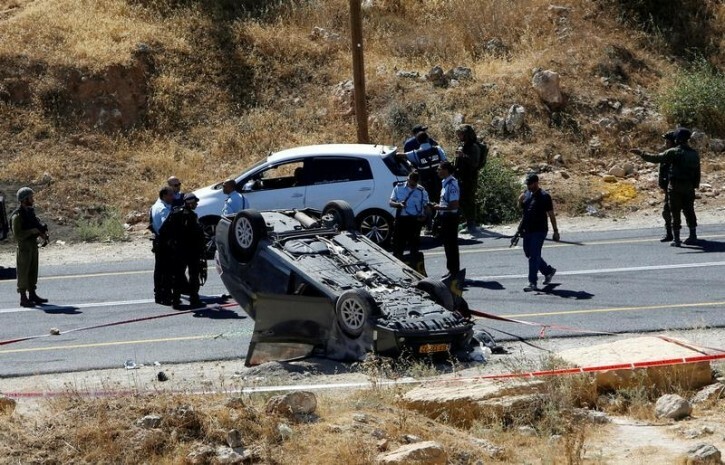 The shooting comes a day after 13-year-old Israeli girl Hallel Yaffa was stabbed to death in her Kiryat Arba home by a Palestinian terrorist from the village of Bani Naim, and after a Tul Karem man went on a stabbing spree in Netanya, injuring two civilians. Both terrorists were shot to death. Meanwhile, the IDF overnight mapped out the home Muhammad Taraireh, the terrorist who carried out the Kiryat Arba stabbing, ahead of its scheduled demolition in Bani Naim. Nahal infantry brigade soldiers arrested three suspected terrorist operatives in the village, and carried out weapons searches. Earlier on Friday, IDF Chief of Staff Lt.-Gen. Gadi Eisenkot visited Kiryat Arba with OC Central Command, Maj.-Gen. Roni Nume, and Judea and Samaria Division Commander, Brig.-Gen. Lior Carmeli. During the tour, Eisenkot received a security briefing from Judea Brigade Commander, Col. Yair Ben Ezra, and other senior commanders in the sector. Since September 2015 to now, 40 people have been killed and 430 injured in a series of Palestinian attacks. Abu mazen has to be eliminated together with all who keep talking of killing jews , enough jewish blood has been spilled due to their incitement . When are we going to wake up and realize that we have no right to put Jewish lives in danger for the sake of settling the land. Which of the gedolei Yisroel allowed this? None! They actually spoke out against it. It is a misguided hashkafa that causes Jewish blood to be spilled. The "natural" reactions that will surely be expressed here - we have to go in and kill them, blow them up, transfer them, scare them, kill all the terrorists, settle the land more, build another yishuv, obama this obama that, UN this, UN that etc are not realistic and will not solve any problems. WE have to have more of a respect for Jewish lives and be less concerned with Jewish pride. The fact that the Arabs are a vicious bloodthirsty people is not relevant right now. “ When are we going to wake up and realize that we have no right to put Jewish lives in danger for the sake of settling the land. Which of the gedolei Yisroel allowed this? None! They actually spoke out against it. It is a misguided hashkafa that causes Jewish blood to be spilled. How about Avraham Avinu when he purchased Miaras Hamachpayla?